Editor’s Note: This is the third installment in our “Building Blogs” series. In the second installment we showed how we created the right content for an audience. As the first search engines began taking shape in the early 90s, few knew how dramatically they would change the world. Fast forward to 2016 and many of the same players are manufacturing driverless cars and building artificial intelligence technology. In case you’re wondering, the answer is no. Google does not know what you ate for lunch. Every year we face major changes to the “rules” of SEO. The algorithms behind search engines are in constant flux. Which means optimizing blog content for search engine performance requires more steps than many B2B marketers realize. With some help from TopRank Marketing, our content optimization efforts have played a big role in growing our blog subscribers by 28.1 times in just 18 months. Wondering how we did it? Read on to discover the 5 people-centric SEO principles that fueled this success. The first principle is deciding where the blog plugs into a broader marketing strategy. 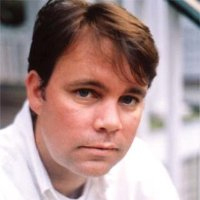 LinkedIn Marketing Solutions offers B2B marketers a variety of tools for reaching customers. But, will folks want to read post after post about LinkedIn Sponsored Content or Sponsored InMail? Probably not. There’s a place for that, and it’s not the blog. We know that B2B marketers need more than product information or company news. Mostly, marketers are hungry for knowledge. Hungry to know what tools are available, which tactics will ensure success, what books they should read, which trends are legitimate and how to remain relevant in an evolving digital world. Of course at some point our readers might also want to know how Sponsored Content, InMail, or Text Ads can help them reach customers. Will we write about that? Sure, once in a while. But the vast majority of content we produce remains focused on solving our reader’s marketing problems. Our second principle for achieving blog growth is to make regular use of the keyword gap analysis. While defining a blog strategy answers the why of what we do, the gap analysis offers a framework for how. Who is currently ranking for specific keywords? How often is new content created around specific keywords? How competitive and challenging will it be to achieve optimal rankings? What related keywords or search opportunities exist? With the answers to those questions in hand, we flesh out our content calendar to meet our audience's needs. To boil it down, optimization is about giving our target audience the type of content they want, in a style they desire, at a frequency that will keep them happy. We optimize for readers, not search engines. Search engines will ultimately follow our audience’s preferences, not the other way around. 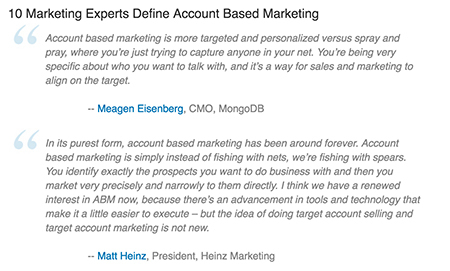 As an example, we recently published a post on account-based marketing that would have looked completely different without first utilizing the gap analysis. We had known for weeks that ABM traffic was beginning to spike, and it was time to get in on the conversation. Without the gap analysis, our knee-jerk reaction to the trend would have been to post an in-depth article about how to make use of several ABM tactics. Sounds useful, right? But, the gap analysis revealed confusion in the marketplace. People weren’t ready for “how to” content. They weren’t even sure what account-based marketing was at that point. Which is why we published a dirt simple post, in which industry experts weighed in on the definitions of this elusive term (see below). Did it perform well? Yup. Another crucial component to our blog growth has been creating data-informed content. While the gap analysis provides us with a regular target for improvement, our keyword glossary keeps us honest about whether we are closing that gap with data-informed content development. We are constantly challenging ourselves to come up with ideas for posts, ebooks, interviews and video series. And while it’s fun to throw ideas out and see what sticks, it’s more fun to create blog content that our audience loves. So, how do we come up with fun content that’s also data-driven? Here’s a snapshot of our process. It’s not perfect, but it works for us. We get together every month and throw fun, crazy, wild, and sometimes terrible ideas against the wall. Then, we map the ones that are really great to the keyword glossary and prioritize the posts based on which target keywords we are trying to rank on that month (and which conversations matter to us). We get together and go through the most important performance metrics like views, time on site, subscribers and shares. We also review specific posts and evaluate whether they met broad objectives, or could be improved upon. We don’t start from scratch every month. During our concept meetings we log all the viable ideas and store them in a backlog for future use. Ideas beget ideas. Take the pressure off by keeping a solid backlog. We’re honest with ourselves and everyone on the content team about performance. But we know that being data-driven also means taking risks and trying new things. So we foster an open, supportive, and honest data-driven content culture. We’re also very open with our readers about what works and what doesn’t. For example, we created two “greatest hits” blog posts that featured all of our top performing content. This helped boost performance of these posts, and offered new visitors a taste of our best content without having to scroll too deep into old content. The rules of online engagement are in constant flux. And many SEO practitioners would have us believe there are hard and fast formulas for success. Put the keyword at the beginning of the post title. Make sure you have 3 links to relevant internal pages. Alt-tags. Meta descriptions. Backlinks. And on and on it goes. The problem with remaining laser-focused on SEO “rules” is content quality typically suffers as a result. Which is why a big part of our blogging success has been a willingness to experiment with post types, titles, on-page elements, content length, and cadence. Sure, we utilize SEO best practices. But we also get creative and crafty too. 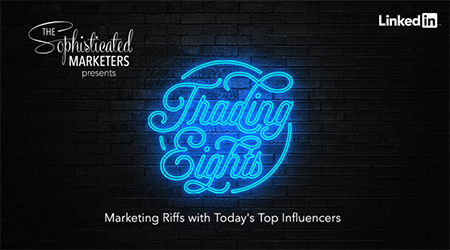 In a recent video series spearheaded by Jason Miller, we tried gating some amazing videos featuring top marketers riffing on digital trends. We assumed offering this much rich video content would incentivize our user-base to fill out a quick form. Did it work? Not at first. Did we give up? Heck no. We had some amazing video content on our hands. We needed to make use of it. So, we broke the videos up into bite-sized chunks and delivered them one by one via the blog along with some additional content and insights. In the end, it worked out wonderfully, especially from an SEO and metrics perspective. The final and most important aspect to our continued blog growth is a dedication to always getting better. SEO is a combat sport. If you stop fighting, you lose. Whether we’re striving for higher quality content, more social shares, views or mentions – our de facto mantra has been to get better every single month. No going backwards. No holds barred. No backing down. On a semi-regular basis, we look at our lowest performing posts and try to understand what went wrong. We might even remove these from the blog, or revise them altogether. No sweeping things under the rug! We’re at all the big content marketing events. We are thrust into more SEO learning opportunities every year than nearly any team around. You can’t make data-driven content if your organization doesn’t fundamentally adopt a data-drive culture. There are tons of tools and resources online (including our blog). Read them all. In our next installment in the "Building Blogs" series, we'll examine how our content team worked hand-in-glove with our demand generation team to boost subscriptions to the blog. In the meantime, don't miss a thing: Subscribe to the LinkedIn Marketing Solutions blog today!